Oh Halifax. The big city of the Maritimes. With your pretty harbour, big bridges, Lululemon and endless array of carb-loading options, you are truly a runner’s heaven. And now after taking part in the 10K run at the giant Blue Nose Marathon over the weekend, I can say I’ll definitely be back again. There’s something about racing in another city that is so exciting. Being a part of this run – with more than 2,600 in the 10K alone – was such a blast. The race was massive (apparently the biggest east of Ottawa) but so well-organized. 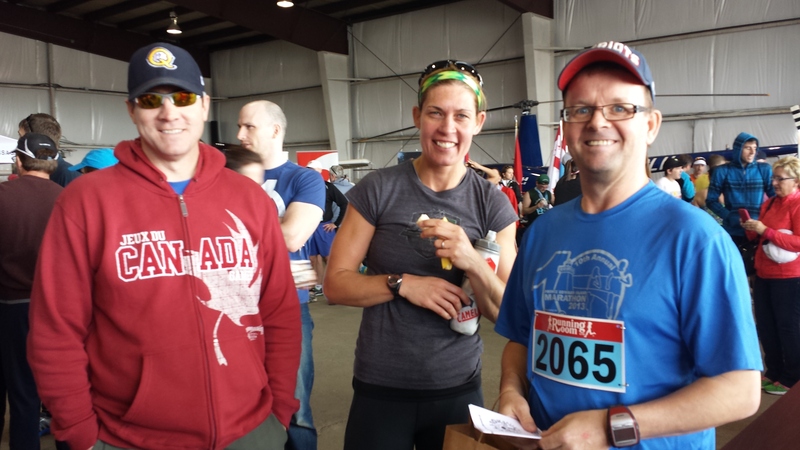 I never waited in line to get my bib, check my bags or pick-up post-race food. The atmosphere was electric. 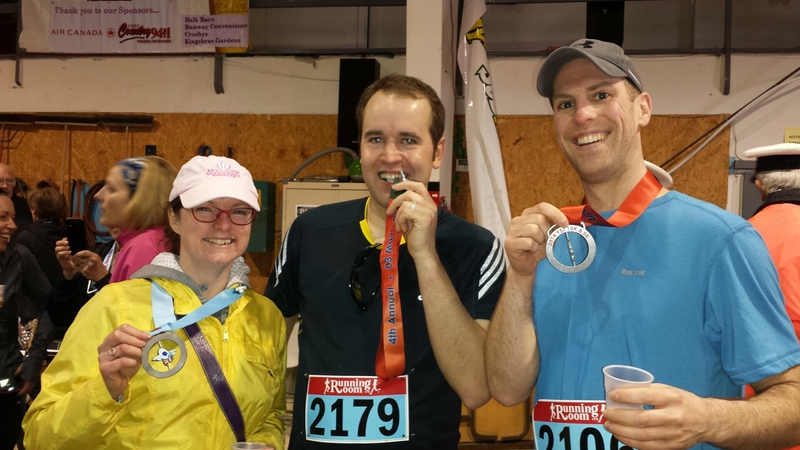 And best of all – despite rain and hills and my typical state of sleep-deprivation – I ran fast! 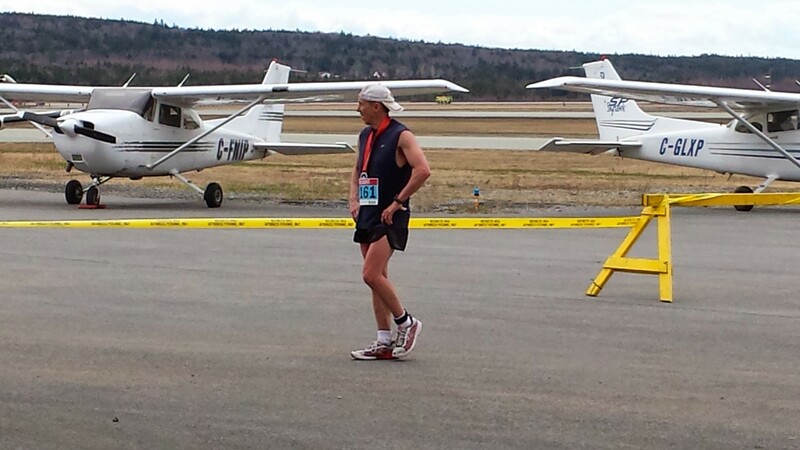 I finished in 54:14, more than a minute faster than my super-flat 10K two weeks ago at the Saint John Airport. 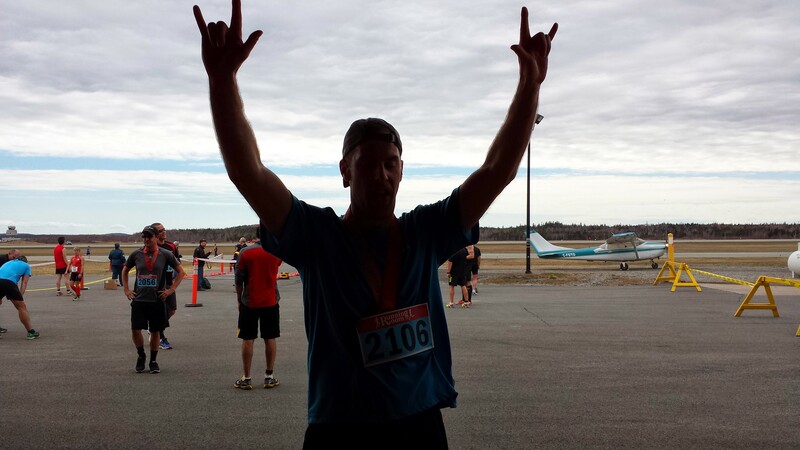 It’s only 45 seconds away from my personal best (from Moncton – a very flat course). Yay! 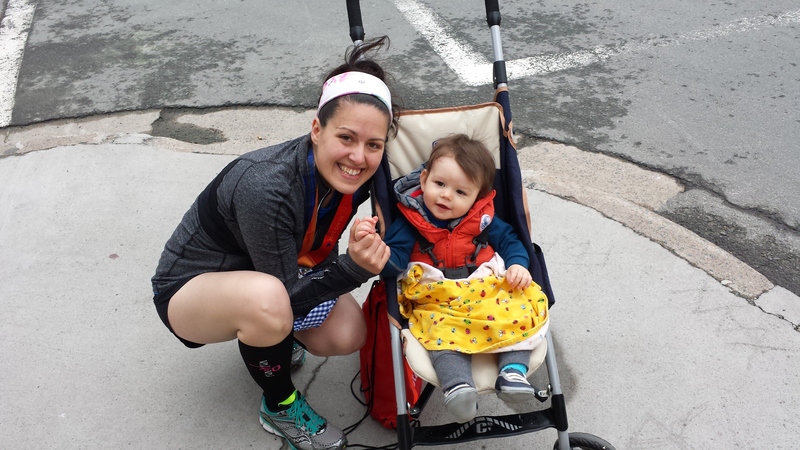 There are a few reasons why this run went better for me: it was interesting and invigorating – running over the MacDonald Bridge, running through a Dartmouth neighbourhood, seeing so many spectators – it really revs you up. Also, after several bad sleeps with Silas, he gave me the gift of only waking up twice the night before the race, and promptly falling back to sleep. Thank you, Darling. And finally, I stopped stressing over the numbers – as discussed in a previous post – and instead focused on running by feel. On the up-hills, and there were a few, a slowed down. At the top, I waited till my heart rate regulated, then built up my pace again. On the down-hills, I coasted. I focused on passing people when I had the energy. When I didn’t, I held back. I ended the run feeling like I pushed as hard as I could, but I didn’t feel horrible. In my books, that’s how to do a race. We had the most delicious, wholesome meal at the Henry House on Barrington Street the night before the run. I had a Cornish pastie and craft beer. My glycogen stores were definitely full. We got a Hotwire deal at the Halliburton on Morris Street, a charming inn in a building dating back to the 1830s. It was a gorgeous spot that included a delicious breakfast every morning (I had toast and homemade jam the morning of the race along with hot coffee). It was just blocks away from the starting line and so close to the water. With so many people running the 10K, we had to line-up a good 25 minutes before the gun. It was a chilly 8 C, and it started to rain as we waited. Not the greatest feeling. Luckily, I decided to wear the tech Blue Nose shirt, which quickly dried off as soon as I started running. I felt pretty special in line because I got to go near the “front” of the pack, since my estimated time was between 50-60 minutes. That’s a pretty average time for a 10K, but I was actually on the fast spectrum. I finished 92/521 in my age category. Yeah! I spotted some local CBC celebrities, including my former j-school classmate, Mackenzie, who was helping out with First Aid. We showed Silas how to cheer for runners as we walked back to our hotel. I think he liked it! I mentioned the bridge, but it was definitely the coolest part of the 10K. There is a pretty big slope upwards as you head toward the middle of the bridge, but then it heads down again as you reach Dartmouth. If I sign up for the Marathon by the Sea in Saint John (planning on it) and the PEI Marathon in October, I’ll receive the Maritime Challenge medal. 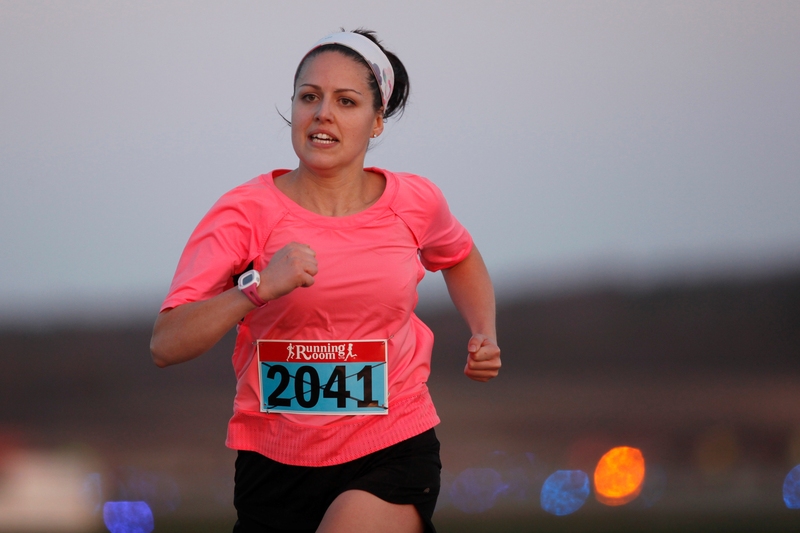 I’m so happy I had the chance to train for and run this race, still on maternity leave. It’s so a great feeling to have my running abilities almost back to where they were pre-baby. Making a weekend of the Blue Nose was so much fun. My race calendar has been a little crazy over the past couple of months, as I have felt the need to make the most of my time off work to fit in races now while I have the chance. When I head back to work in a few weeks, it will probably slow down. But I’m planning to continue running, and hope to train for a half-marathon this summer or fall. I’ve been on a bit of a good running streak lately, signing up for lots of races and getting a little faster along the way. 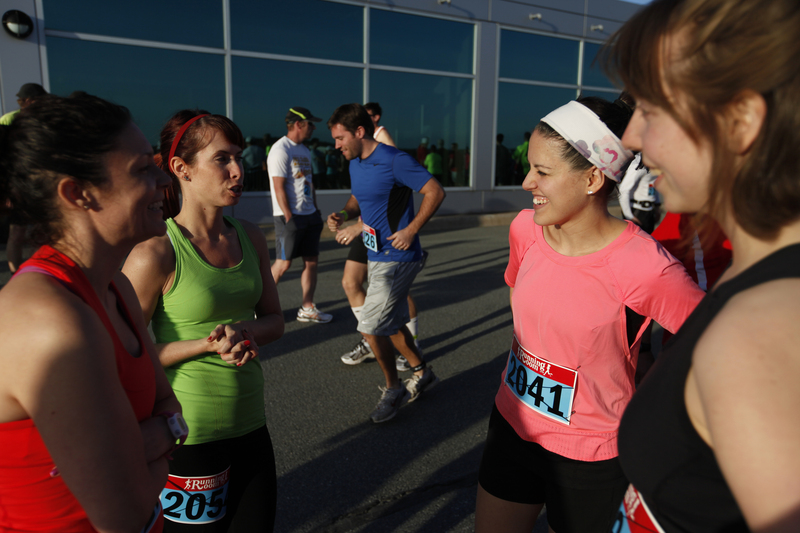 So when the Saint John Airport 10K came along on Saturday, I was like, I’ve got this. 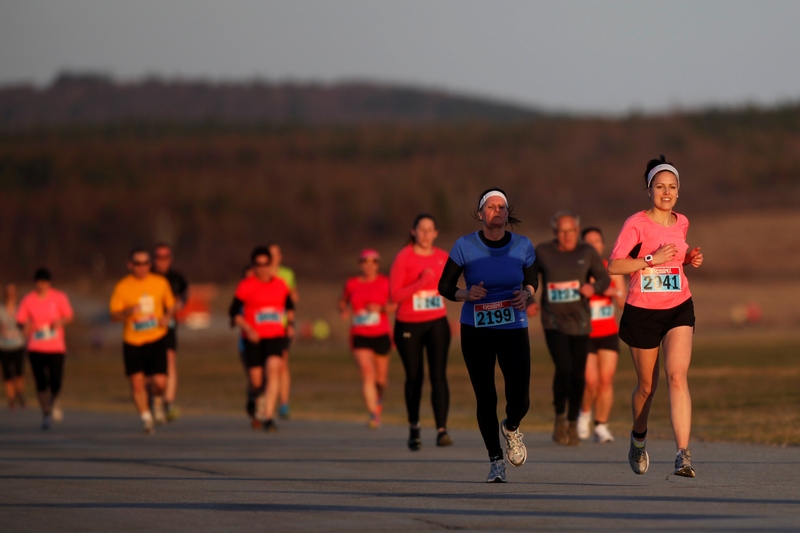 The race is always a blast, as you take off with a throng of runners on a fast, flat course. My goal was to beat 55:17. 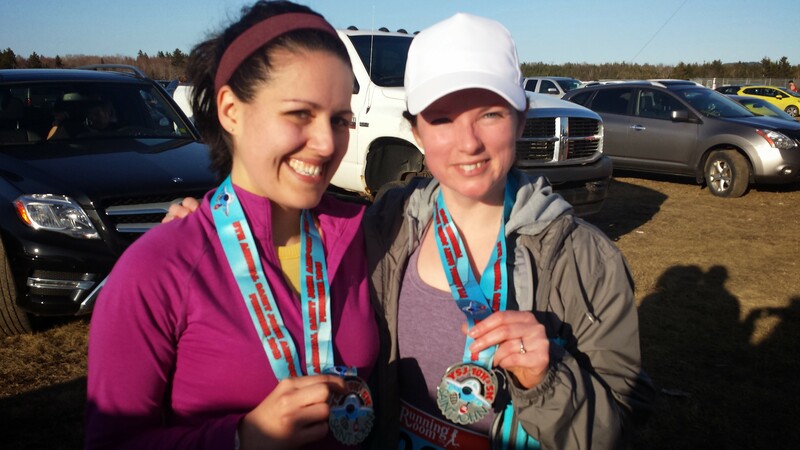 I figured it was reasonable for a new mama, because it was my time for the same course three years ago, for my first 10K. (I ran it again in 2013 at 53:57). So I strapped on my Garmin and told myself to keep a pace under 5:30 min/km. It went pretty well for the first half. In fact, my pace was closer to 5:15. I was feeling very confident. But then, after circling the airport runway once, I realized I was out of juice. All I had in me was 5K at that pace. I had to slow down. Suddenly I was way over 5:30. And I felt pretty downtrodden. I was about to clock in a personal worst for a 10K. For the remainder of the race, I obsessively checked my watch. I made little goals to force myself to keep running. But I felt like I was going on fumes. It did not feel fun at all. My face was red hot and my mouth was dry. I finished at 55:20, which is actually not bad, considering my pace for recent races. 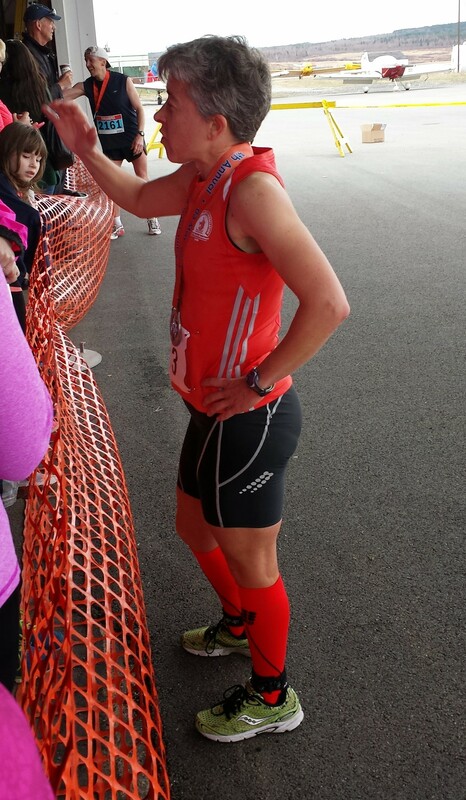 I placed 7/20 in my age group. But I still felt humbled – and exhausted. I realized I still have some work to do before I am as fit as I was pre-pregnancy. Upon reflection, I’ve realized why I did not feel good about this race. I was too hung up on the numbers. When I enjoy a run, I’m feeling the air, listening to the sounds, and finding my comfortable pace. I didn’t allow myself to do that on Saturday. Instead, I was a slave to the watch. I know there are many other things I could have done to make this race better: get more sleep, drink more water. I should have had a little snack shortly before the race. I could have trained better. But I’m not in this to win. I run because I enjoy it. And why bother if I’m going to get hung up on paces, numbers, seconds? Lesson learned: for my next 10K in Halifax two weeks from now, I will not wear a watch. OK, I might wear it, but if I do, I will set my pace based on how I feel. I’ll enjoy the experience, and take it as it comes. 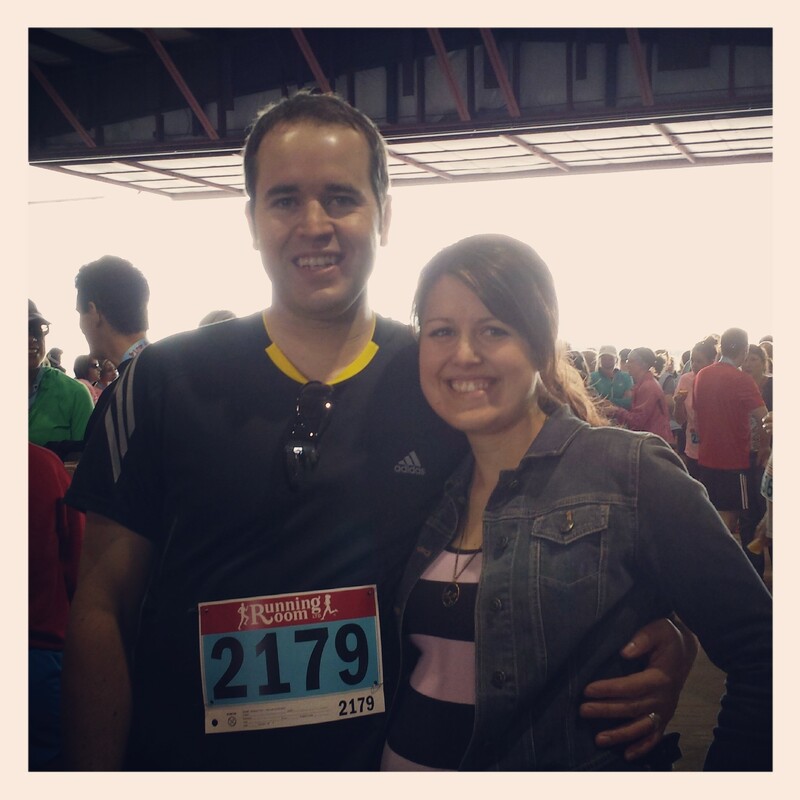 Over the past couple weeks, I had not one, but two vivid dreams that I was able to take part in this year’s YSJ 10K. At nearly 33 weeks pregnant, this simply was not possible for me. But on Saturday, I did have joy of watching my husband and many close friends cross the finish line. I got to live vicariously through their collective exhilaration. 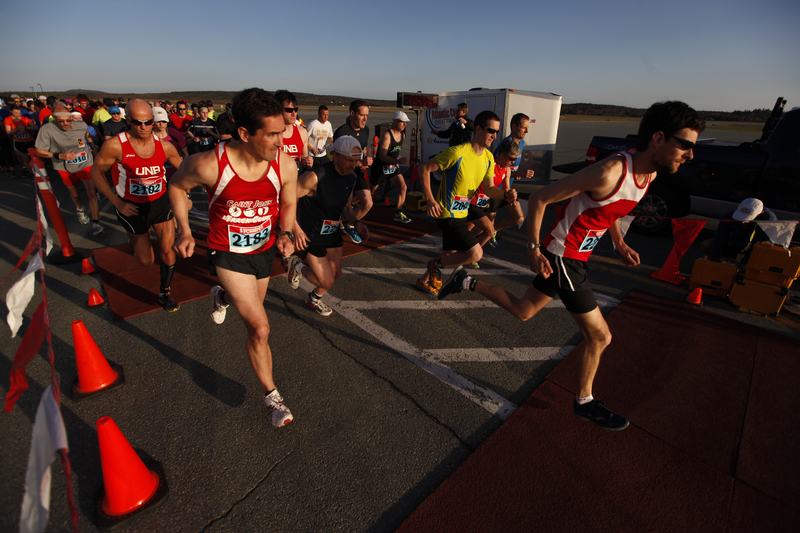 The Saint John Airport run gives runners the unique opportunity of running the flat asphalt of the airport runway. One lap is five kilometres, and two laps is 10K. This was the event’s fourth year. 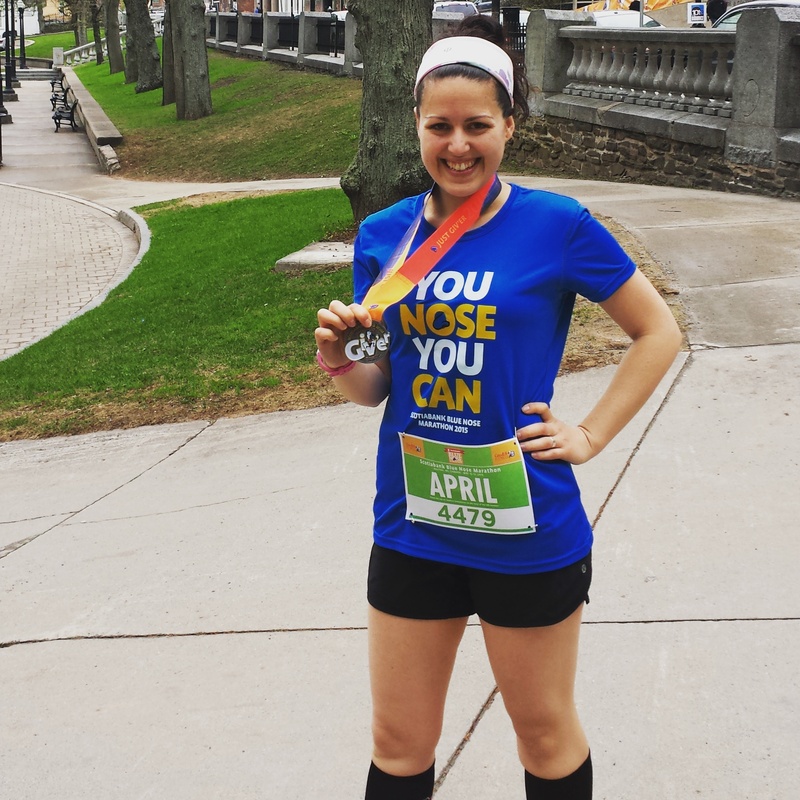 I have run the 10K race twice before – last year and in 2012 – and I will never forget the feeling I had two year ago for my first 10K. I couldn’t believe I had it in me. It’s what inspired me to tackle my first half-marathon later that summer. This year, I learned to take a step back and watch (with glee) as my husband had that experience for the first time too. Despite tackling his first 10K after working a night shift, he excelled with a time of 53:21. Aside from watching Mark, I had so much fun mingling about, chatting to friends and people I have met through the running community and my work at the Telegraph-Journal. What a thrill to catch the male and female winners of the 10K. 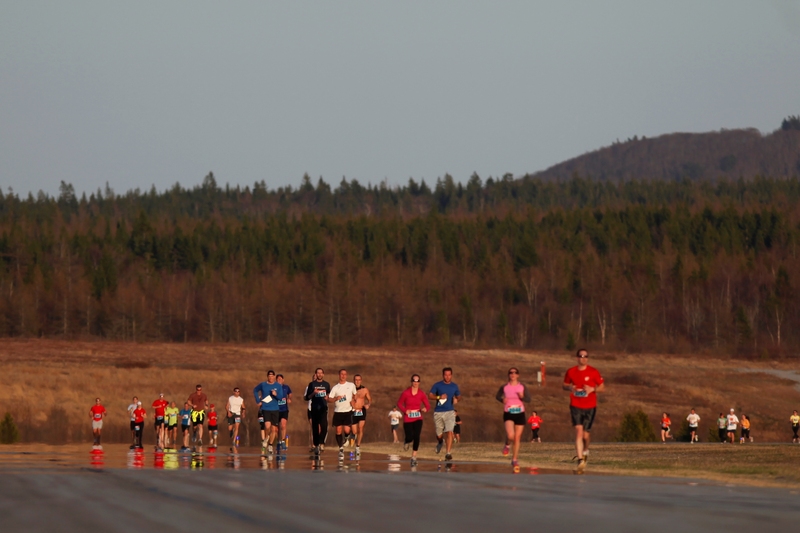 What a great way to kick-off the 2014 running season, which for me will be a spectator sport. 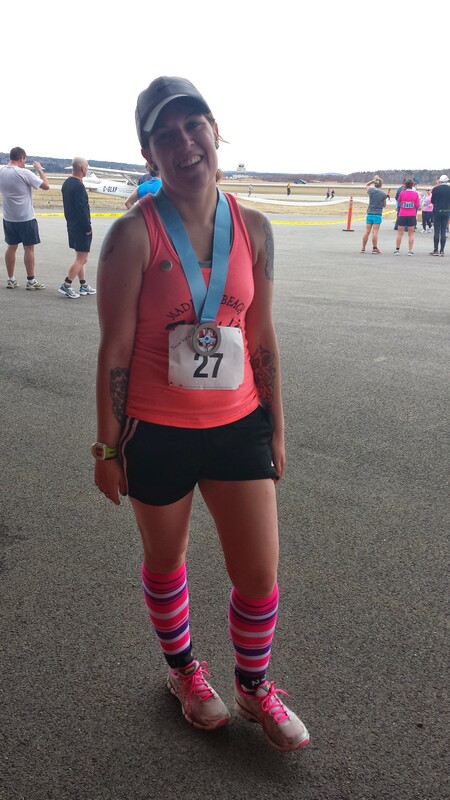 It was my first 10K since the half marathon last month, and it felt great. 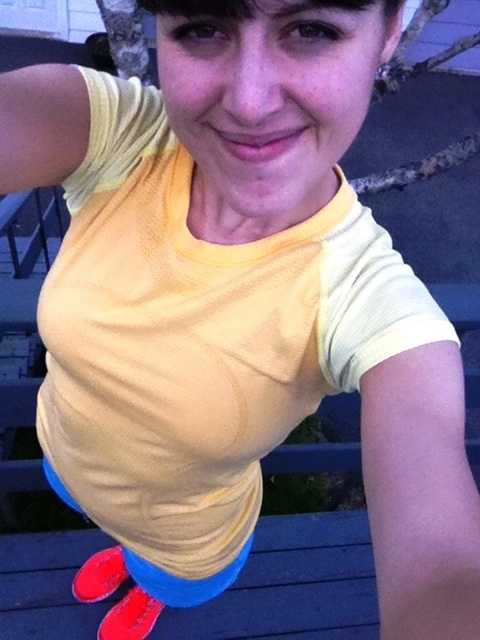 I wore my new Nike shorts and other bright colours! I could smell fresh cut grass and lilacs. I felt strong and steady for the whole run, and didn’t stop to walk at all. I didn’t get home from work till 6:30 p.m., and I was starving, so I ate a sugary granola bar pre-run. Thanks to Topher Seguin for sharing his great photos. First lap complete at 5K mark.